Proprietary Name: Lidocaine Hydrochloride What is the Proprietary Name? Lidocaine Hydrochloride with NDC 70518-1894 is a a human prescription drug product labeled by Remedyrepack Inc.. The generic name of Lidocaine Hydrochloride is lidocaine hydrochloride. The product's dosage form is solution and is administered via oral; topical form. FDA Application Number: ANDA040014 What is the FDA Application Number? Postmarketing cases of seizures, cardiopulmonary arrest, and death in patients under the age of 3 years have been reported with use of Lidocaine Hydrochloride Oral Topical Solution, USP (Viscous) 2% when it was not administered in strict adherence to the dosing and administration recommendations. In the setting of teething pain, Lidocaine Hydrochloride Oral Topical Solution, USP (Viscous) 2% should generally not be used. For other conditions, the use of the product in patients less than 3 years of age should be limited to those situations where safer alternatives are not available or have been tried but failed.To decrease the risk of serious adverse events with use of Lidocaine Hydrochloride Oral Topical Solution, USP (Viscous) 2%, instruct caregivers to strictly adhere to the prescribed dose and frequency of administration and store the prescription bottle safely out of reach of children. 2O. The molecular weight is 234.34. Each mL contains 20 mg of lidocaine HCl. In addition each mL contains the following inactive ingredients: Carboxymethylcellulose sodium, methylparaben, natural orange flavor, propylparaben, purified water, and saccharin sodium. The pH is adjusted to 5.0 to 7.0 by means of hydrochloric acid and/or sodium hydroxide. Lidocaine is absorbed following topical administration to mucous membranes, its rate and extent of absorption being dependent upon concentration and total dose administered, the specific site of application, and duration of exposure. In general, the rate of absorption of local anesthetic agents following topical application occurs most rapidly after intratracheal administration. Lidocaine is also well-absorbed from the gastrointestinal tract, but little intact drug appears in the circulation because of biotransformation in the liver. The plasma binding of lidocaine is dependent on drug concentration, and the fraction bound decreases with increasing concentration. At concentrations of 1 to 4 mcg of free base per mL, 60 to 80 percent of lidocaine is protein bound. Binding is also dependent on the plasma concentration of the alpha-1-acid glycoprotein.Lidocaine crosses the blood-brain and placental barriers, presumably by passive diffusion. Lidocaine is metabolized rapidly by the liver, and metabolites and unchanged drug are excreted by the kidneys. Biotransformation includes oxidative N-dealkylation, ring hydroxylation, cleavage of the amide linkage, and conjugation. N-dealkylation, a major pathway of biotransformation, yields the metabolites monoethylglycinexylidide and glycinexylidide. The pharmacological/toxicological actions of these metabolites are similar to, but less potent than, those of lidocaine. Approximately 90% of lidocaine administered is excreted in the form of various metabolites, and less than 10% is excreted unchanged. The primary metabolite in urine is a conjugate of 4-hydroxy-2, 6-dimethylaniline.The elimination half-life of lidocaine following an intravenous bolus injection is typically 1.5 to 2.0 hours. Because of the rapid rate at which lidocaine is metabolized, any condition that affects liver function may alter lidocaine kinetics. The half-life may be prolonged two-fold or more in patients with liver dysfunction. Renal dysfunction does not affect lidocaine kinetics but may increase the accumulation of metabolites.Factors such as acidosis and the use of CNS stimulants and depressants affect the CNS levels of lidocaine required to produce overt systemic effects. Objective adverse manifestations become increasingly apparent with increasing venous plasma levels above 6.0 mcg free base per mL. In the rhesus monkey arterial blood levels of 18to21 mcg/mL have been shown to be threshold for convulsive activity. Lidocaine Hydrochloride Oral Topical Solution, USP (Viscous) 2% is indicated for the production of topical anesthesia of irritated or inflamed mucous membranes of the mouth and pharynx. It is also useful for reducing gagging during the taking of X-ray pictures and dental impressions. Lidocaine is contraindicated in patients with a known history of hypersensitivity to local anesthetics of the amide type, or to other components of the solution. EXCESSIVE DOSAGE, OR SHORT INTERVALS BETWEEN DOSES, CAN RESULT IN HIGH PLASMA LEVELS AND SERIOUS ADVERSE EFFECTS. 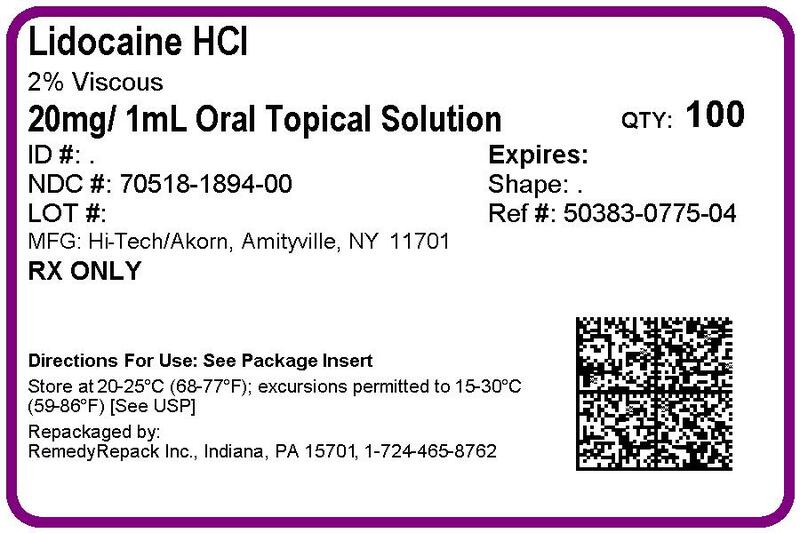 PATIENTS SHOULD BE INSTRUCTED TO STRICTLY ADHERE TO THE RECOMMENDED DOSAGE AND ADMINISTRATION GUIDELINES AS SET FORTH IN THIS PACKAGE INSERT.THE MANAGEMENT OF SERIOUS ADVERSE REACTIONS MAY REQUIRE THE USE OF RESUSCITATIVE EQUIPMENT, OXYGEN, AND OTHER RESUSCITATIVE DRUGS.Lidocaine Hydrochloride Oral Topical Solution, USP (Viscous) 2% should be used with extreme caution if the mucosa in the area of application has been traumatized, since under such conditions there is the potential for rapid systemic absorption. Postmarketing cases of seizures, cardiopulmonary arrest, and death in patients under the age of 3 years have been reported with use of Lidocaine Hydrochloride Oral Topical Solution, USP (Viscous) 2% when it was not administered in strict adherence to the dosing and administration recommendations. In the setting of teething pain, Lidocaine Hydrochloride Oral Topical Solution, USP (Viscous) 2% should generally not be used. For other conditions, the use of the product in patients less than 3 years of age should be limited to those situations where safer alternatives are not available or have been tried but failed. Cases of methemoglobinemia have been reported in association with local anesthetic use. Although all patients are at risk for methemoglobinemia, patients with glucose-6-phosphate dehydrogenase deficiency, congenital or idiopathic methemoglobinemia, cardiac or pulmonary compromise, infants under 6 months of age, and concurrent exposure to oxidizing agents or their metabolites are more susceptible to developing clinical manifestations of the condition. If local anesthetics must be used in these patients, close monitoring for symptoms and signs of methemoglobinemia is recommended.Signs of methemoglobinemia may occur immediately or may be delayed some hours after exposure, and are characterized by a cyanotic skin discoloration and/or abnormal coloration of the blood. Methemoglobin levels may continue to rise; therefore, immediate treatment is required to avert more serious central nervous system and cardiovascular adverse effects, including seizures, coma, arrhythmias, and death. Discontinue Lidocaine Hydrochloride Oral Topical Solution, USP (Viscous) 2% and any other oxidizing agents. Depending on the severity of the signs and symptoms, patients may respond to supportive care, i.e., oxygen therapy, hydration. A more severe clinical presentation may require treatment with methylene blue, exchange transfusion, or hyperbaric oxygen. Parents and caregivers should be cautioned about the following:For patients under 3 years of age, special care must be given to accurately measuring the prescribed dose and not administering the product more often than prescribed. To ensure accuracy, we recommend you use a measuring device to carefully measure the correct volume. The product should only be used for the prescribed indication. To reduce the risk of accidental ingestion, the product container should be tightly closed and the product should be stored well out of reach of all children immediately after each use. If the patient shows signs of systemic toxicity (e.g., lethargy, shallow breathing, seizure activity) emergency medical attention should be sought immediately and no additional product should be administered. Unused product should be discarded in a manner that prevents possible exposure to children and pets. All patients should be aware that when topical anesthetics are used in the mouth or throat, the production of topical anesthesia may impair swallowing and thus enhance the danger of aspiration. For this reason, food should not be ingested for 60 minutes following use of local anesthetic preparations in the mouth or throat area. This is particularly important in children because of their frequency of eating. Numbness of the tongue or buccal mucosa may increase the danger of biting trauma. For this reason food and/or chewing gum should not be used while the mouth or throat area is anesthetized. ADVERSE REACTIONS). The lowest dosage that results in effective anesthesia should be used to avoid high plasma levels and serious adverse effects. Repeated doses of lidocaine may cause significant increases in blood levels with each repeated dose because of slow accumulation of the drug and/or its metabolites. Tolerance varies with the status of the patient. Debilitated, elderly patients, acutely ill patients, and children should be given reduced doses commensurate with their age, weight and physical condition. Lidocaine should also be used with caution in patients with severe shock or heart block. Lidocaine Hydrochloride Oral Topical Solution, USP (Viscous) 2% should be used with caution in persons with known drug sensitivities. Patients allergic to para-aminobenzoic acid derivatives (procaine, tetracaine, benzocaine, etc.) have not shown cross sensitivity to lidocaine. Reproduction studies have been performed in rats at doses up to 6.6 times the human dose and have revealed no evidence of harm to the fetus caused by lidocaine. There are, however, no adequate and well-controlled studies in pregnant women. Because animal reproduction studies are not always predictive of human response, this drug should be used in pregnancy only if clearly needed. It is not known whether this drug is excreted in human milk. Because many drugs are excreted in human milk, caution should be exercised when lidocaine is administered to nursing women. CNS manifestations are excitatory and/or depressant and may be characterized by lightheadedness, nervousness, apprehension, euphoria, confusion, dizziness, drowsiness, tinnitus, blurred or double vision, vomiting, sensations of heat, cold or numbness, twitching, tremors, convulsions, unconsciousness, respiratory depression and arrest. The excitatory manifestations may be very brief or may not occur at all, in which case the first manifestation of toxicity may be drowsiness merging into unconsciousness and respiratory arrest.Drowsiness following the administration of lidocaine is usually an early sign of a high blood level of the drug and may occur as a consequence of rapid absorption. Allergic reactions are characterized by cutaneous lesions, urticaria, edema or anaphylactoid reactions. Allergic reactions may occur as a result of sensitivity either to the local anesthetic agent or to the methylparaben and/or propylparaben used in this formulation. Allergic reactions as a result of sensitivity to lidocaine are extremely rare and, if they occur, should be managed by conventional means. The detection of sensitivity by skin testing is of doubtful value.To report SUSPECTED ADVERSE REACTIONS, contact Hi-Tech Pharmacal Co., Inc. at 1-800-262-9010 or FDA at 1-800-FDA-1088 or www.fda.gov/medwatch. 50 of lidocaine in non-fasted female rats is 459 (346-773) mg/kg (as the salt) and 214 (159-324) mg/kg (as the salt) in fasted female rats. Care must be taken to ensure correct dosage in all pediatric patients as there have been cases of overdose due to inappropriate dosing.It is difficult to recommend a maximum dose of any drug for children since this varies as a function of age and weight. For children over 3 years of age who have a normal lean body mass and normal body development, the maximum dose is determined by the child's weight or age. For example: in a child of 5 years weighing 50 lbs., the dose of lidocaine hydrochloride should not exceed 75-100 mg (3.7 to 5 mL of Lidocaine Hydrochloride Oral Topical Solution, USP (Viscous) 2%).For infants and in children under 3 years of age, the solution should be accurately measured and no more than 1.2 mL be applied to the immediate area with a cotton-tipped applicator. Wait at least 3 hours before giving the next dose; a maximum of four doses may be given in a 12-hour period. Lidocaine Hydrochloride Oral Topical Solution, USP (Viscous) 2%) should only be used if the underlying condition requires treatment with a volume of product that is less than or equal to 1.2 mL.